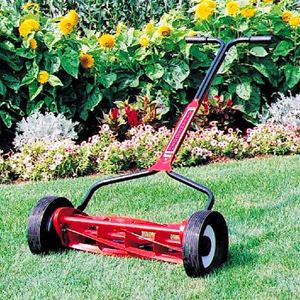 Spring is here: And it’s time to tune up your reel mower. First check to be sure all nuts are tight and that the handle is secure. Spray some silicone spray on the blades and wipe clean after spraying. Blade Adjustment: Brill and NaturCut mowers use an adjustment gauge which sets the gap properly between the reel blades and bedknife. Turn the mower over and put the gauge between the reel blades and the bedknife on one side. With a 10 mm wrench gently tighten the nut about a 1/4 turn. Do the same to the other side. Blade should just barely miss the bedknife when it spins. If there is a slight contact that is fine. 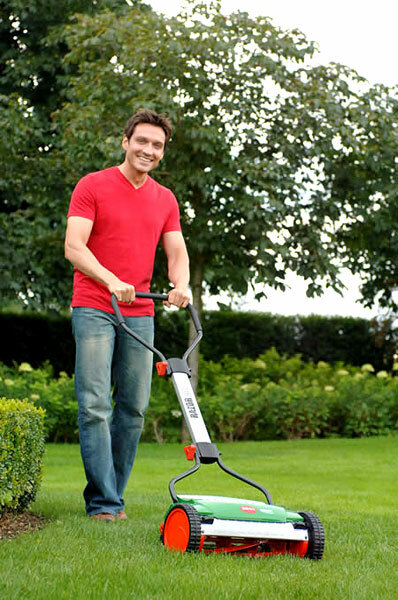 Silent Cut and Fiskars: Silent Cut mowers and Fiskars Momentum use a slightly different system. Consult the manual and follow the adjustment directions. Silicone Spray: To take excellent care of your mower, we recommend spraying the blades with silicone spray before each mowing. And we recommend wiping the blades clean with a rag after each mowing. This keeps the mower clean and helps it run well longer.